Menulog delivers for Medan Ciak so you'll be able to track your courier on a map. 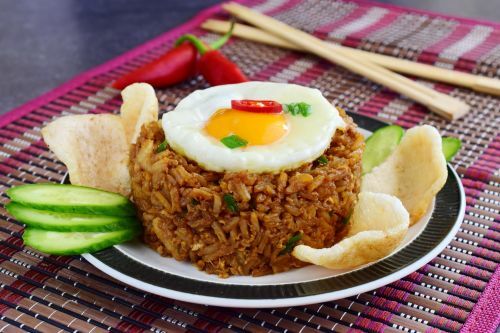 Indonesian traditional fried rice served with 1/4 fried chicken, fried shallot and cucumber. Medanese style fried rice with BBQ pork, Chinese sausage, prawn, fish ball, egg and shallot. Stemed rice served with beef rendang, fried chicken, vegetable curry, boiled egg, sambal, cassava leaves, peanuts, anchovies and chilli crackers. Rice cakes served with beef rendang, fried chicken, vegetable curry, boiled egg, chilli chips, peanut and anchovies. Hainese chicken rice served with fried chicken, soy sauce egg, chilli potato, cucumber and pickles shallot. Coconut rice served with fried chicken, beef rendang, boiled egg sambal, peanut, anchovy fish, crackers, cucumber and fried shredded coconut. Steamed rice served with stir fry kangkung (water spinach) and fried chicken. Fried noodles with BBQ pork, Chinese sausages, prawn, fish, egg, shallot and bean sprout. Fried thin rice noodles with BBQ pork, prawn, egg, Chinese sausage, fish cake, shallot and bean sprout. Noodles, caramalized pork, soy sauce egg, fish ball, wonton or pork dumpling, fried sgallot, fried pork fat, pickles onion and chilli. Fried flat rice noodles with BBQ pork, prawn, egg, Chinese sausages, fish cake, shallot and bean sprout. Fried flat rice noodles with shrimp paste, prawn, egg, fish cake, water spinach, shallot and bean sprout. Fried noodles with shrimp paste, prawn, egg, fish cake, kangkung (water spinach), shallot and bean sprout. Fried rice with shredded chicken, red chilli sauce, roasted peanut, fried eggs, prawn crackers and cucumber. Fried rice with green chilli sauce, shredded chicken, fried eggs, prawn crackers, anchovies and cucumber. Steamed rice served with roast pork, BBQ pork, soy sauce egg, steamed vegetable, cucumber and sweet soy sauce. Fried rice with roast pork, egg, cucumber, shallot and chilli sauce.